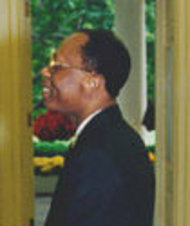 Jean-Bertrand Aristide on 14 October 1994. Jean-Bertrand Aristide (born 15 July 1953) is a former Haitian priest and politician who became Haiti's first democratically elected president. A proponent of liberation theology, Aristide was appointed to a Roman Catholic parish in Port-au-Prince in 1982 after completing his studies to become a priest of the Salesian order. He became a focal point for the pro-democracy movement first under Jean-Claude "Baby Doc" Duvalier and then under the military transition regime which followed. 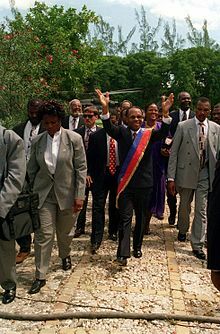 He won the Haitian general election between 1990 and 1991, with 67% of the vote and was briefly president of Haiti, until a September 1991 military coup. The coup regime collapsed in 1994 under U.S. pressure and threat of force (Operation Uphold Democracy). Aristide was then president again from 1994 to 1996 and from 2001 to 2004. However, Aristide was ousted in the 2004 coup d'état after right-wing ex-army paramilitaries invaded the country from across the Dominican border. As he claimed, the United States helped orchestrate the coup against him. Aristide was later forced into exile in the Central African Republic and South Africa. He finally returned to Haiti in 2011 after seven years in exile. Between 1957 and 1986, Haiti was ruled by the family dictatorships of François "Papa Doc" and Jean-Claude "Baby Doc" Duvalier. The misery endured by Haiti's poor made a deep impression on Aristide himself, and he became an outspoken critic of Duvalierism. Nor did he spare the hierarchy of the country's church, since a 1966 Vatican Concordat granted Duvalier one-time power to appoint Haiti's bishops. An exponent of liberation theology, Aristide denounced Duvalier's regime in one of his earliest sermons. This did not go unnoticed by the regime's top echelons. Under pressure, the provincial delegate of the Salesian Order sent Aristide into three years of exile in Montreal. By 1985, as popular opposition to Duvalier's regime grew, Aristide was back preaching in Haiti. His Easter Week sermon, "A call to holiness", delivered at the cathedral of Port-au-Prince and later broadcast throughout Haiti, proclaimed: "The path of those Haitians who reject the regime is the path of righteousness and love." Aristide became a leading figure in the Ti Legliz movement, whose name means "little church" in Kreyòl. In September 1985, he was appointed to St. Jean Bosco church, in a poor neighborhood in Port-au-Prince. Struck by the absence of young people in the church, Aristide began to organize youth, sponsoring weekly youth Masses. He founded an orphanage for urban street children in 1986 called Lafanmi Selavi [Family is Life]. :214 Its program sought to be a model of participatory democracy for the children it served. As Aristide became a leading voice for the aspirations of Haiti's dispossessed, he inevitably became a target for attack. He survived at least four assassination attempts. The most widely publicized attempt, the St. Jean Bosco massacre, occurred on 11 September 1988, when over one hundred armed Tontons Macoute wearing red armbands forced their way into St. Jean Bosco as Aristide began Sunday Mass. As army troops and police stood by, the men fired machine guns at the congregation and attacked fleeing parishioners with machetes. Aristide's church was burned to the ground. Thirteen people are reported to have been killed, and 77 wounded. Aristide survived and went into hiding. Subsequently, Salesian officials ordered Aristide to leave Haiti, but tens of thousands of Haitians protested, blocking his access to the airport. In December 1988, Aristide was expelled from his Salesian order. A statement prepared by the Salesians called the priest's political activities an "incitement to hatred and violence", out of line with his role as a clergyman. Aristide appealed the decision, saying: "The crime of which I stand accused is the crime of preaching food for all men and women." In a January 1988 interview, he said "The solution is revolution, first in the spirit of the Gospel; Jesus could not accept people going hungry. It is a conflict between classes, rich and poor. My role is to preach and organize...." In 1994, Aristide left priesthood, ending years of tension with the church over his criticism of its hierarchy and his espousal of liberation theology. Aristide married Mildred Trouillot, on January 20, 1996, with whom he had two daughters. Following the violence at the aborted national election of 1987, the 1990 election was approached with caution. Aristide announced his candidacy for the presidency. Following a six-week campaign, during which he dubbed his followers the "Front National pour le Changement et la Démocratie" (National Front for Change and Democracy, or FNCD), Aristide was elected president in 1990 with 67% of the vote in what is generally recognized as the first honest election in Haitian history. However, just eight months into his presidency he was overthrown by a bloody military coup. He broke from FNCD and created the Struggling People's Organization (OPL, Organisation Politique "Lavalas") – "the flood" or "torrent" in Kréyòl. During Aristide's short-lived first period in office, he attempted to carry out substantial reforms, which brought passionate opposition from Haiti's business and military elite. He sought to bring the military under civilian control, retiring the commander in chief of the army Hérard Abraham, initiated investigations of human rights violations, and brought to trial several Tontons Macoute who had not fled the country. He also banned the emigration of many well known Haitians until their bank accounts had been examined. His relationship with the National Assembly soon deteriorated, and he attempted repeatedly to bypass it on judicial, Cabinet and ambassadorial appointments. His nomination of his close friend and political ally, René Préval, as prime minister, provoked severe criticism from political opponents overlooked, and the National Assembly threatened a no-confidence vote against Préval in August 1991. This led to a crowd of at least 2000 at the National Palace, which threatened violence; together with Aristide's failure to explicitly reject mob violence this permitted the junta which would topple him to accuse him of human rights violations. In September 1991 the army performed a coup against him (1991 Haitian coup d'état), led by army general Raoul Cédras, who had been promoted by Aristide in June to commander in chief of the army. Aristide was deposed on 29 September 1991, and after several days sent into exile, his life only saved by the intervention of U.S., French and Venezuelan diplomats. In accordance with the requirements of article 149 of the Haitian Constitution, Superior Court justice Joseph Nérette was installed as président provisoire to serve until elections were held within 90 days of Aristide's resignation. However, real power was held by army commander Raoul Cédras. The elections were scheduled, but were cancelled under pressure from the United States government. Aristide and other sources claim that both the coup and the election cancellation were the result of pressure from the American government. High-ranking members of the Haitian National Intelligence Service (SIN), which had been set up and financed in the 1980s by the U.S. Central Intelligence Agency (CIA) as part of the war on drugs, were involved in the coup, and were reportedly still receiving funding and training from the CIA for intelligence-gathering activities at the time of the coup, but this funding reportedly ended after the coup. The New York Times said that "No evidence suggests that the C.I.A backed the coup or intentionally undermined President Aristide." However, press reports about possible CIA involvement in Haitian politics before the coup sparked congressional hearings in the United States. A campaign of terror against Aristide supporters was started by Emmanuel Constant after Aristide was forced out. In 1993, Constant, who had been on the CIA's payroll as an informant since 1992, organized the Front for the Advancement and Progress of Haïti (FRAPH), which targeted and killed Aristide supporters. Aristide spent his exile first in Venezuela and then in the United States, working to develop international support. A United Nations trade embargo during Aristide's exile, intended to force the coup leaders to step down, was a strong blow to Haiti's already weak economy. President George H.W. Bush granted an exemption from the embargo to many U.S. companies doing business in Haiti, and president Bill Clinton extended this exemption. In addition to this trade with the United States, the coup regime was supported by massive profits from the drug trade thanks to the Haitian military's affiliation with the Cali Cartel; Aristide publicly stated that his own pursuit of arresting drug dealers was one event that prompted the coup by drug-affiliated military officials Raul Cedras and Michel Francois (a claim echoed by his former secretary of State Patrick Elie). Representative John Conyers (D-Michigan) expressed concern that the only U.S. government agency to publicly recognize the Haitian junta's role in drug trafficking was the Drug Enforcement Administration, and that, despite a wealth of evidence provided by the DEA proving the junta's drug connections, the Clinton administration downplayed this factor rather than use it as a hedge against the junta (as the U.S. government had done against Manuel Noriega). Nairn in particular alleged that the CIA's connections to these drug traffickers in the junta not only dated to the creation of SIN, but were ongoing during and after the coup. Nairn's claims are confirmed in part by revelations of Emmanuel Constant regarding the ties of his FRAPH organization to the CIA before and during the coup government. In late 1996, Aristide broke from the OPL over what he called its "distance from the people" and created a new political party, the Fanmi Lavalas. The OPL, holding the majority in the Sénat and the Chambre des Députés, renamed itself the Organisation du Peuple en Lutte, maintaining the OPL acronym. Between early 2001 and 2004 rightwing ex-army paramilitary groups conducted a violent insurgency murdering dozens of Lavalas activists, officials, and civilians--as documented in the book "Paramilitarism and the assault on democracy in Haiti" (Monthly Review, 2012). Based in the Dominican Republic, these groups formed ties with narco criminals in the port city of Gonaives and among elite led opposition groups in Port-au-Prince. In February 2004, the killing of gang leader Amiot Metayer was used to spark violent attacks on police in Gonaives. Amiot's brother, Buteur Metayer, blamed Aristide for the assassination, and used this as an argument given in order to support the right-wing paramilitary group known as the National Revolutionary Front for the Liberation of Haiti. The paramilitary campaign was headed by ex-army/police chief and convicted narco trafficker Guy Philippe and former FRAPH death squad founder Louis Jodel Chamblain . The rebels soon took control of the North, and eventually laid siege to, and then invaded, the capital. Under disputed circumstances, Aristide was flown out of the country by the U.S. with help from Canada and France on 28 February 2004. Aristide and his bodyguard, Franz Gabriel, stated that he was the victim of a "new coup d'état or modern "kidnapping" by U.S. forces. Mrs. Aristide stated that the kidnappers wore U.S. Special Forces uniforms, but changed into civilian clothes upon boarding the aircraft that was used to remove them from Haiti. Jamaican prime minister P. J. Patterson released a statement saying "we are bound to question whether his resignation was truly voluntary, as it comes after the capture of sections of Haiti by armed insurgents and the failure of the international community to provide the requisite support. The removal of president Aristide in these circumstances sets a dangerous precedent for democratically elected governments anywhere and everywhere, as it promotes the removal of duly elected persons from office by the power of rebel forces." Aristide later stated that France and the U.S. had a role in what he termed "a kidnapping" that took him from Haiti to South Africa via the Central African Republic. However, authorities said his temporary asylum there had been negotiated by the United States, France and Gabon. On 1 March 2004, U.S. congresswoman Maxine Waters (D-CA), along with Aristide family friend Randall Robinson, reported Aristide had told them that he had been forced to resign and had been abducted from the country by the United States and that he had been held hostage by an armed military guard. According to representative Maxine Waters D-California, Mildred Aristide called her at her home at 6:30 am to inform her "the coup d'etat has been completed", and Jean-Bertrand Aristide said the U.S. embassy in Haiti's chief of staff came to his house to say he would be killed "and a lot of Haitians would be killed" if he refused to resign immediately and said he "has to go now". Aristide's letter, which is described as his resignation, does not actually have Aristide as clearly and officially resigning. Representative Charles Rangel, D-New York, expressed similar words, saying Aristide had told him he was "disappointed that the international community had let him down" and "that he resigned under pressure" – "As a matter of fact, he was very apprehensive for his life. They made it clear that he had to go now or he would be killed." When asked for his response to these statements Colin Powell said that "it might have been better for members of Congress who have heard these stories to ask us about the stories before going public with them so we don't make a difficult situation that much more difficult" and he alleged that Aristide "did not democratically govern or govern well". CARICOM, an organization of Caribbean countries that included Haiti, called for a United Nations investigation into Aristide's removal, but were reportedly pressured by the U.S. and France to drop their request. Some observers suggest the rebellion and removal of Aristide were covertly orchestrated by these two countries and Canada. In a 2006 interview, Aristide said the United States went back on their word regarding compromises he made with them over privatization of enterprises to ensure that part of the profits would go to the Haitian people and then "relied on a disinformation campaign" to discredit him. On 21 December 2007, a speech by Aristide marking the new year and Haiti's Independence Day was broadcast, the fourth such speech since his exile; in the speech he criticized the 2006 presidential election in which Préval was elected, describing it as a "selection", in which "the knife of treason was planted" in the back of the Haitian people. Since the election, some high-ranking members of Lavalas have been targets for violence. Lovinsky Pierre-Antoine, a leading human rights organizer in Haiti and a member of Lavalas, disappeared in August 2007. His whereabouts remain unknown and a news article states: "Like many protesters, he [Wilson Mesilien, coordinator of the pro-Aristide 30 September Foundation] wore a T-shirt demanding the return of foundation leader Lovinsky Pierre-Antoine, a human rights activist and critic of both U.N. and U.S. involvement in Haiti who disappeared in August." In a 2008 United States embassy cable, former U.S. ambassador to Haiti Janet Sanderson emphasized that: "A premature departure of MINUSTAH would leave the [Haitian] government...vulnerable to...resurgent populist and anti-market economy political forces—reversing gains of the last two years. MINUSTAH is an indispensable tool in realizing core USG [U.S. government] policy interests in Haiti." At a meeting with U.S. State Department officials on 2 August 2006, former Guatemalan diplomat Edmond Mulet, then chief of MINUSTAH, "urged U.S. legal action against Aristide to prevent the former president from gaining more traction with the Haitian population and returning to Haiti". At Mulet’s request, UN secretary general Kofi Annan urged South Africa’s president Thabo Mbeki "to ensure that Aristide remained in South Africa". U.S. ambassador James Foley wrote in a confidential 22 March 2005 cable that an August 2004 poll "showed that Aristide was still the only figure in Haiti with a favorability rating above 50%". On 16 December 2009, several thousand protesters marched through Port-au-Prince calling for Aristide's return to Haiti, and protesting the exclusion of Aristide's Fanmi Lavalas party from upcoming elections. In February 2011, Aristide announced "I will return to Haiti" within days of the ruling Haitian government removing impediments to him receiving his Haitian passport. On 17 March 2011, Aristide departed for Haiti from his exile in South Africa. U.S. president Barack Obama had asked South African president Jacob Zuma to delay Aristide's departure to prevent him from returning to Haiti before a presidential run-off election scheduled for Sunday. Aristide's party was barred from participating in the election, and the U.S. fear his return could be "destabilizing". On Friday, 18 March 2011, he and his spouse arrived at Port-au-Prince Airport, and was greeted by thousands of supporters. He told the crowd waiting at the airport: "The exclusion of Fanmi Lavalas is the exclusion of the Haitian people. In 1804, the Haitian revolution marked the end of slavery. Today, may the Haitian people end exiles and coups d’État, while peacefully moving from social exclusion to inclusion." Since Aristide returned to Haiti, he has abstained from political involvement. However, on 12 September 2014, Aristide was ordered under house arrest by Judge Lamarre Belzaire while under a corruption investigation. Aristide's lawyers and supporters of Fanmi Lavalas questioned the legality of the judge's order under Haitian law as well as the judge's impartiality. Under president Aristide's leadership, his party implemented many major reforms. These included greatly increasing access to health care and education for the general population, increasing adult literacy and protections for those accused of crimes, improving training for judges, prohibiting human trafficking, disbanding the Haitian military (which primarily had been used against the Haitian people), establishing improved human rights and political freedom; doubling the minimum wage, instituting land reform and assistance to small farmers, providing boat construction training to fishermen, establishing a food distribution network to provide low cost food to the poor at below market prices, building low-cost housing, and attempting to reduce the level of government corruption. During successive Lavalas administrations, Jean-Bertrand Aristide and René Préval built 195 new primary schools and 104 secondary schools. Prior to Aristide's election in 1990, there were just 34 secondary schools nationwide. Lavalas also provided thousands of scholarships so that children could afford to attend church/private schools. Between 2001 and 2004, the percentage of children enrolled in primary school education rose to 72%, and an estimated 300,000 adults took part in Lavalas sponsored adult literacy campaigns. This helped the adult literacy rate rise from 35% to 55%. Despite operating under an aid embargo, the Lavalas administration succeeded in reducing the infant mortality rate as well as reducing the percentage of underweight newborns. A successful AIDS prevention and treatment program was also established, leading the Catholic Institute for International Relations to state: the "incredible feat of slowing the rate of new infections in Haiti has been achieved despite the lack of international aid to the Haitian government, and despite the notable lack of resources faced by those working in the health field". The Lavalas political project has long been dedicated to promoting a civilian police force and disbanding the long-time tools of elite repression in Haiti which have been the country's brutal military and paramilitary forces. The government under Aristide launched the first trial of paramilitary death squads and successfully jailed many after aired on Haitian public television trials of FAdH  and FRAPH  members involved in massacres of civilians. Trials were held bringing to justice a handful of wealthy individuals from among Haiti's upper class that had financed paramilitary death squads. These included individuals such as Judy C Roy (who has acknowledged her financing of the FLRN death squads), and others some of whom held close ties with the former dictators Raoul Cedras and Jean-Claude Duvalier. Reforming the country's security services though posed a constant problem for Lavalas, as the U.S. sought to undermine these reform efforts by seeking to re-insert its rightwing allies into the police force. The Lavalas government also faced a lack of resources as U.S. officials under the Bush regime between 2000 and 2004 supported a cut off in aid to the government. Meanwhile the corrupting influence of the narco-trade continued to be present among the police as it had in earlier periods. November 2004 Dominican president Leonel Fernandez gave a speech in front of other regional leaders in which he said Aristide commanded "great popular support" within Haiti and called for his inclusion in the country’s democratic future. "Bienvenu later offered to express our shared concerns in Pretoria, perhaps under the pretext that as a country desiring to secure a seat on the UN Security Council, South Africa could not afford to be involved in any way with the destabilization of another country....2 (S) Bienvenu speculated on exactly how Aristide might return, seeing a possible opportunity to hinder him in the logistics of reaching Haiti. If Aristide traveled commercially, Bienvenu reasoned, he would likely need to transit certain countries in order to reach Haiti. Bienvenu suggested a demarche to CARICOM countries by the U.S. and EU to warn them against facilitating any travel or other plans Aristide might have.... Both Bienvenu and Barbier confided that South African mercenaries could be heading towards Haiti, with Bienvenu revealing the GOF had documented evidence that 10 South African citizens had come to Paris and requested Dominican visas between February and the present." A June 2005 cable states: "the GOB (Government of Brazil) officials made clear continued Brazilian resolve to keep Aristide from returning to the country or exerting political influence. The GOB had been encouraged by recent South African Government commitments to Brazil that the GSA (Government of South Africa) would not allow Aristide to use his exile there to undertake political efforts." President René Préval made reference to these rumors, telling the ambassador that he did not want Aristide "anywhere in the hemisphere". Subsequent to that, he remarked that he was concerned that Aristide would accept the Chávez offer but deflected any discussion of whether Préval himself was prepared to raise the matter with Chávez. Human Rights Watch accused the Haitian police force under president Aristide and his political supporters of attacks on opposition rallies. They also said that the emergence of armed rebel groups seeking to overthrow Aristide reflected "the failure of the country's democratic institutions and procedures". A detailed study on the armed rebel paramilitaries has found that these groups received vital support from a handful of Haitian elites, Dominican governmental sectors, and foreign intelligence. The undermanned Haitian police faced difficulties in fending off cross-border attacks led by the ex-army paramilitary rebels. Videos surfaced showing a portion of a speech by Aristide on 27 August 1991, which took place just after army and death squad members attempted to assassinate him, where he says "Don't hesitate to give him what he deserves. What a beautiful tool! What a beautiful instrument! What a beautiful piece of equipment! It's beautiful, yes it's beautiful, it's cute, it's pretty, it has a good smell, wherever you go you want to inhale it." Critics allege that he was endorsing the practice of "necklacing" opposition activists – placing a gasoline-soaked tire around a person's neck and setting the tire ablaze – others argue he was actually speaking about people using the constitution to empower themselves. Earlier in the speech he is quoted as saying "Your tool in hand, your instrument in hand, your constitution in hand! Don't hesitate to give him what he deserves. Your equipment in hand, your trowel in hand, your pencil in hand, your Constitution in hand, don't hesitate to give him what he deserves." Although there were accusations of human rights abuses, the OAS/UN International Civilian Mission in Haiti, known by the French acronym MICIVIH, found that the human rights situation in Haiti improved dramatically following Aristide's return to power in 1994. Amnesty International reported that, after Aristide's departure in 2004, Haiti was "descending into a severe humanitarian and human rights crisis". BBC correspondents say Mr Aristide is seen as a champion of the poor, and remains popular with many in Haiti. Aristide continues to be among the most important political figures in the country, and is considered by many to be the only really popular, democratically elected leader Haiti has ever had. Yet his second administration was targeted for destabilization and is remembered as a time of great difficulty of many. Some officials have been indicted by a U.S. court. Companies that allegedly made deals with Aristide's government included IDT, Fusion Telecommunications, and Skytel; critics claim the two first companies had political links. AT&T reportedly declined to wire money to "Mont Salem". Aristide's supporters say corruption charges against the former president are a deliberate attempt to keep a popular leader from running in elections. In 2000 Aristide published The Eyes of the Heart: Seeking a Path for the Poor in the Age of Globalization, which accused the World Bank and the International Monetary Fund of working on behalf of the world's wealthiest nations rather than in the interest of genuine international development. Aristide called for "a culture of global solidarity" to eliminate poverty as an alternative to the globalization represented by neocolonialism and neoliberalism. ^ "Military ousts Haiti's leader, claims power President Aristide en route to France; fighting kills 26". The Boston Globe. 1 October 1991. ^ "Haiti: The impact of the 1991 coup". International Journal of Refugee Law. June 1992. ^ a b c d e f "Aristide says U.S. deposed him in 'coup d'etat'". CNN. 2 March 2004. Retrieved 6 May 2010. ^ a b Randal C. Archibold (18 March 2011). "Just Days Before Election, Aristide Returns to Cheers and Uncertainty in Haiti". New York Times. ^ a b Danner, Mark (4 November 1993). "Haiti on the Verge". The New York Review. Retrieved 20 May 2010. ^ a b "Aristide no stranger to struggle". Associated Press. 16 February 2004. Archived from the original on 21 February 2004. Retrieved 30 January 2010. ^ a b Danner, Mark (18 November 1993). "The Prophet". The New York Review. Archived from the original on 8 September 2008. Retrieved 27 April 2010. ^ Gallo, Michael F. (Fall 1989). "Hope in Haiti? An interview with Jean-Bertrand Aristide". Touchstone Magazine. 3 (3). Retrieved 10 May 2010. ^ "Concordat Watch: Papa Doc's Concordat (1966)". Retrieved 10 May 2010. ^ Hallward, Peter (May–June 2004). "Option Zero in Haiti". New Left Review. 27 (May–June 200). Retrieved 20 May 2010. ^ Rohter, Larry (24 July 1994). "Liberal Wing of Haiti's Church Resists Military". The New York Times. Retrieved 20 May 2010. ^ Bernat, J. Christopher (1999). "Children and the Politics of Violence in Haitian Context: Statist violence, scarcity and street child agency in Port-au-Prince". Critique of Anthropology. 19 (2): 121–138. CiteSeerX 10.1.1.623.758. doi:10.1177/0308275x9901900202. Retrieved 10 May 2010. ^ French, Howard (24 September 1988). "Attack on Priest Called Haiti Catalyst". The New York Times. Retrieved 20 May 2010. ^ Farmer, Paul. "Who is Aristide, from Uses of Haiti". Common Courage Press. Retrieved 17 February 2014. ^ Treaster, Joseph B. (23 September 1988). "Haiti Terrorists Form in New Groups". The New York Times. Retrieved 23 May 2010. ^ Treaster, Joseph B. (18 December 1988). "A Haitian Priest is Ousted by Order". The New York Times. Retrieved 20 May 2010. ^ Corbett, Bob. "Aristide resigning his priesthood?". Archived from the original on 29 May 2010. Retrieved 20 May 2010. ^ Rohter, Larry (17 November 1994). "Aristide decides to quit as priest". The New York Times. Retrieved 10 May 2010. ^ Pierre-Pierre, Gary (1996-01-21). "Many in Haiti Are Troubled By Marriage Of Aristide". New York Times. Archived from the original on 2018-06-12. Retrieved 2019-02-20. ^ "Jean-Bertrand Aristide's Tumultuous Career". Archived from the original on 20 January 2010. Retrieved 13 January 2010. ^ Collins, Edward Jr., Cole, Timothy M. (1996), "Regime Legitimation in Instances of Coup-Caused Governments-in-Exile: The Cases of Presidents Makarios and Aristide", Journal of International Law & Practice 5(2), p 220. ^ a b c d e Collins, Edward Jr., Cole, Timothy M. (1996), "Regime Legitimation in Instances of Coup-Caused Governments-in-Exile: The Cases of Presidents Makarios and Aristide", Journal of International Law & Practice 5(2), p 219. ^ Collins, Edward Jr., Cole, Timothy M. (1996), "Regime Legitimation in Instances of Coup-Caused Governments-in-Exile: The Cases of Presidents Makarios and Aristide", Journal of International Law & Practice 5(2), p 199. ^ "Leader of Haiti Ousted Military Takes Over After Seizing Aristide". St. Louis Post-Dispatch. 1 October 1991. Archived from the original (reprint) on 10 November 2012. ^ a b c Peter Hallward (22 February 2007). "An Interview with Jean-Bertrand Aristide". London Review of Books. pp. 9–13. ^ Marc Weisbrot (13 December 2005). "U.S. Is Still Undermining Haiti". Z Magazine. Archived from the original on 29 September 2007. ^ Vincent Browne (17 January 2010). "Haiti's never-ending tragedy has American roots". The Sunday Business Post on-line. ^ a b French, Howard W.; Time Weiner (14 November 1993). "C.I.A. Formed Haitian Unit Later Tied to Narcotics Trade". New York Times. Retrieved 6 May 2010. ^ a b Jim Mann (2 November 1993). "Congress to Probe CIA-Haiti Ties". Los Angeles Times. ^ Rupert Cornwell (7 October 1994). "CIA 'helped to set up terror group' in Haiti". London: The Independent. ^ Mark Weisbrot (22 November 2005). "Undermining Haiti". The Nation. ^ Victoria Graham (27 August 1993). "UN Ready To End Haiti Sanctions". The Seattle Times. ^ Sydney P. Freedberg, Rachel L. Swarns (3 November 1994). "Poorly Enforced Sanctions Botch U.S. Embargo of Haiti". The Seattle Times. ^ Carl Hartman (18 February 1994). "Americans Step Up Business With Haiti Despite Sanctions". The Seattle Times. ^ Dailey, Peter (13 March 2003). "Haiti: The Fall of the House of Aristide". New York Review of Books. 50 (4). Retrieved 14 February 2010. ^ "Election watch Haiti". CNN. 26 November 2000. Retrieved 6 May 2010. ^ Rhodes-Pitts, Sharifa (4 January 2004). "A call for $21 billion from France aims to lift Haiti's bicentennial blues". Boston Globe. Retrieved 25 January 2010. ^ MacDonald, Isabel (16 August 2010). "France's debt of dishonour to Haiti". The Guardian. London. ^ Klarreich, Kathie (23 February 2004). "Letter From Haiti: A Battle of Cannibals And Monsters". Time Magazine. ^ Steven, Dudley (15 February 2004). "Disparate forces behind the violent opposition in Haiti". Boston Globe. ^ "Haiti's Aristide defiant in exile". BBC News. 8 March 2004. ^ Associated Press (1 March 2004). "Looters pick through Aristide's villa: Letters about the CIA, FBI left behind". CNN. Archived from the original on 5 March 2004. Retrieved 21 February 2017. ^ Reuters (1 March 2004). "Haitians emerge to work, or party". CNN. Retrieved 29 January 2010. ^ Paul Farmer (15 April 2004). "Who removed Aristide?". London Review of Books. pp. 28–31. ^ Associated Press (1 March 2004). "Aristide arrives for African exile". CNN International. Archived from the original on 5 March 2004. Retrieved 21 February 2017. ^ "Rep Maxine Waters: Aristide Says 'I Was Kidnapped'". Democracy Now. Retrieved 19 April 2015. ^ Thalif Deen (13 April 2004). "US, France Block UN Probe of Aristide Ouster". Inter Press Service. ^ "Aristide, víctima y verdugo | el Dipló". ^ Munnion, Christopher (1 June 2004). "Mbeki rolls out the red carpet for exile Aristide". The Daily Telegraph. London. Retrieved 14 February 2010. ^ Momberg, Eleanor (1 June 2004). "Warm welcome for Aristide". Independent Online (IOL). Retrieved 14 February 2010. ^ Political Bureau (25 June 2009). "Ex president living it up in SA". Independent Online (IOL). Retrieved 14 February 2010. ^ a b Smith, David (15 January 2010). "Haiti's exiled former president vows to return". London: Guardian News and Media. Retrieved 6 May 2010. ^ "Exiled Aristide gets SA doctorate" Archived 28 February 2008 at the Wayback Machine, iafrica.com, 26 April 2007. ^ "Exiled former Haitian president stirs supporters with speech", Associated Press (International Herald Tribune), 22 December 2007. ^ "Dr. Maryse Narcisse Kidnapped in Haiti" Archived 2 November 2007 at the Wayback Machine Dr. Maryse Narcisse – a member of the National Commission of the Fanmi Lavalas Party – was kidnapped in October 2007, and later freed after a ransom was paid. ^ Fondasyon Mapou and the Haitian Priorities Project (14 August 2007). "We are urging for the safe return of Lovinsky Pierre-Antoine". Press release. Toronto Haiti Action Committee. Retrieved 14 February 2010. ^ Katz, Jonathan M.; AP (29 February 2008). "Thousands march in Haiti on anniversary of Aristide's departure". San Diego Union-Tribune. Retrieved 14 February 2010. ^ "Haiti 'to allow' Aristide return". BBC. 23 February 2006. ^ "Thousands demand Aristide return". BBC. 16 July 2006. ^ "Aristide supporters protest election ban in Haiti". Reuters. 17 December 2009. ^ "Aristide wishes to leave SA for Haiti". IOL News. 15 Jan 2010. Retrieved 19 April 2015. ^ Rossier, Nicolas (15 February 2011). "An Exclusive Interview With Former Haitian President Jean-Bertrand Aristide". Huffington Post. ^ "Haiti's former president Jean-Bertrand Aristide vows to return". Retrieved 17 February 2014. ^ "Returning to Haiti, Aristide says Haitians who fought for democracy are happy he's coming home". Washington Post. 18 March 2011. Archived from the original on 10 December 2018. ^ Joseph Guyler Delva and Pascal Fletcher (19 March 2011). "Aristide makes triumphant Haiti return before vote". Reuters Africa. ^ Archibold, Randal C. (2014-09-12). "Ex-President of Haiti Put Under House Arrest". The New York Times. ^ Stephen Lendman (16 December 2005). "Achievements Under Aristide, Now Lost". ZNet. Archived from the original on 19 September 2012. ^ a b "Paramilitarism and the Assault on Democracy in Haiti". Monthly Review Press. 15 August 2012. ^ "16.11.2004: DOMINICAN POLITICS #8: FERNANDEZ, THE RIO GROUP AND HAITI". WikiLeaks. 16 November 2004. WikiLeaks cable: 04SANTO DOMINGO006213. Retrieved 19 April 2015. ^ "01.07.2005: FRENCH SHARE CONCERNS ON POSSIBLE ARISTIDE RETURN TO HAITI". WikiLeaks. 1 July 2005. WikiLeaks cable: 05PARIS004660. Retrieved 19 April 2015. ^ "06.10.2005: SENION GOB OFFICIALS DISCUSS HAITI WITH AMBASSADOR AND WHA DAS FISK". WikiLeaks. 6 October 2005. WikiLeaks cable: 05BRASILIA1578. Retrieved 19 April 2015. ^ "03.10.2008: RUMORS ABOUND REGARDING ARISTIDE´S POSSIBLE MOVE TO VENEZUELA". WikiLeaks. 3 October 2008. WikiLeaks cable: 08PORTAUPRINCE001392. Retrieved 19 April 2015. ^ "Haiti: Aristide Should Uphold Rule of Law". Human Rights Watch. 13 February 2004. ^ a b Haïti Observateur (27 September 1992). "Aristide's "Pe Lebrun" speech". Haïti Observateur. Retrieved 10 January 2011. ^ Associated Press (17 February 2004). "Haiti's Aristide prepares for a fight". USA Today. Retrieved 14 February 2010. ^ Lisa Pease (1 February 2010). "America's Sad History with Haiti, Part 2". Consortium News. ^ "Three Years of Defending Human Rights". United Nations. September 1995. Archived from the original on 10 March 2008. ^ "Haiti Human Rights". Amnesty International. Archived from the original on 10 February 2010. ^ "UN troops disperse Haiti protesters supporting Aristide". BBC News. August 2014. ^ "America's subversion of Haiti's democracy continues". The Guardian. 13 March 2012. ^ "Indictments in Alleged Aristide Corruption Case". Press release. Haiti Democracy Project. 8 December 2009. Retrieved 14 February 2010. ^ O'Grady, Mary Anastasia (28 July 2008). "Aristide's American Profiteers". Opinion. Wall Street Journal. Retrieved 14 February 2010. ^ O'Grady, Mary Anastasia (3 June 2005). "Aristide's Past Deserves More Intense Scrutiny". Opinion. Wall Street Journal. Retrieved 14 February 2010. ^ O'Grady, Mary Anastania (12 February 2007). "The Haiti File". Opinion. Wall Street Journal. Retrieved 14 February 2010. ^ Vardi, Nathan (10 December 2009). "Will Bribery Probe Hit IDT? Company dealt with indicted Haitian telco official". Forbes. Retrieved 14 February 2010. ^ "Aristide supporters clash with Haiti police". www.aljazeera.com. Retrieved 23 May 2015. ^ Jean-Bertrand Aristide, "Introduction", The Haitian Revolution by Toussaint L'Ouverture (New York and London, Verso, 2008), p. xxxiii. "6/7: the massacre of the poor that the world ignored: The US cannot accept that the Haitian president it ousted still has support", Naomi Klein, The Guardian, 18 July 2005. 'The Return': Aristide, Law and Democracy in Haiti, Brian Concannon Jr., JURIST, 26 June 2006. "Jean-Bertrand Aristide collected news and commentary". The New York Times. .
On my return to Haiti..., Jean-Bertrand Aristide, The Guardian, 4 February 2011.